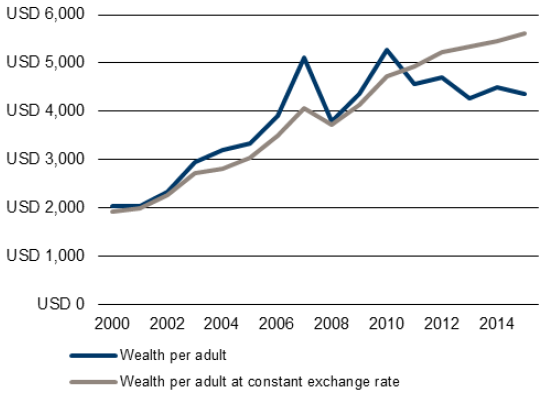 A new report, “Global Wealth Databook 2015” by top a global financial services firm based in Zurich, Credit Suisse, has found the existence of huge wealth differences in India. The report says that 755,563,000, or 95.4 per cent of adults in India, own wealth less than $10,000, while a minuscule 185,000, or 0.023 per cent of Indian adults, own more than $1 million. The report has two other categories falling in between – those owning wealth between $10,000 and $100,000, and those owning between $100,000 and $1 million. 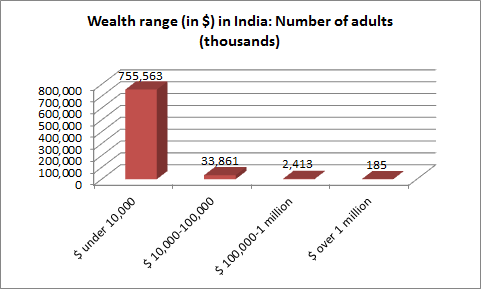 While India’s 33,867,000 adults, or 4.28 per cent, fall in the former category, another 2,413,000 adults, or 0.3 per cent adults, fall in the latter category. In all, there are 790,022,000 adults in the country. The report sharply disagrees with those who define middle class on the basis of income or consumption pattern. Based on the income method, in 2005, the World Bank had estimated middle class population at 264 million, using the median poverty line in 70 countries at the lower extreme ($2 per day), and the United States poverty line ($13 per day) as an upper extreme. 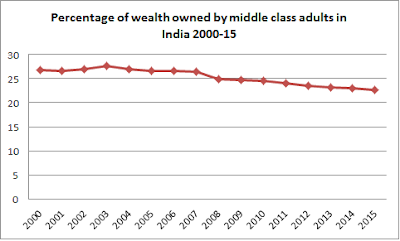 The other method, of using the consumption-based, criterion, (ownership of car or scooter, colour television, or telephone in households), found that India 20 per cent of population, or slightly over 200 million, belonged to the middle class. 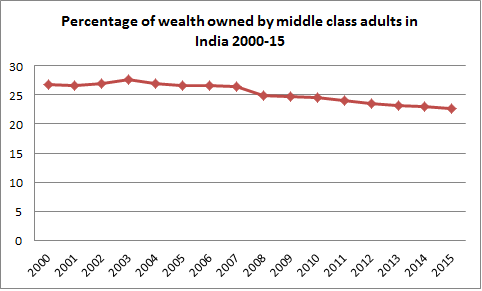 Basing its calculation of the middle class on the basis of the ownership of wealth ($13,700 or more), the report finds that in India its share is 22.6% ($780 billion) of the country’s wealth. 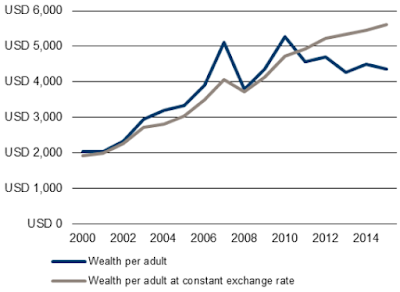 However, it finds that this share is declining over the last 15 years – it was 26.8 per cent in the year 2000, remained almost constant till 2007 at 26.4 per cent, but began declining to reach 24.9 per cent in 2008, 23.2 per cent in 2013, 23 per cent in 2014, and 22.6 per cent in 2015. “Across regions, the middle class is most prevalent in North America, where 39 per cent of adults qualify, followed by Europe, where the proportion is one third. The share then drops sharply, to 15 per cent for the Asia-Pacific region (excluding China and India), around 11 per cent in China and Latin America, and just 3 per cent in Africa and India”, it says.